Be the first to get NHL 17 news, videos and exclusive Insider content. We are excited to announce that the next cover athlete for EA SPORTS NHL will once again be in the hands of you, the fans. This year, eight superstars have been selected to represent their NHL and World Cup of Hockey teams to compete for the cover of NHL 17. 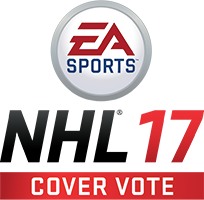 All you have to do is head to NHL.com/CoverVote or Twitter and Tweet your vote using the official hashtag #NHL17CoverVote and a player hashtag below. Make sure to cast your vote on Twitter every Thursday, as each vote will count as double! The winner of the NHL 17 Cover Vote will be revealed at the NHL Awards. This event will also be your first opportunity to see the world premiere of NHL 17 gameplay, so mark your calendars. Can’t wait to learn more about NHL 17? Sign up to become an EA SPORTS NHL 17 Insider and get early access to news, trailers, behind-the-scenes videos, exclusive content and more. Billed as a generational talent, Connor McDavid didn’t waste any time proving to the hockey world that he is the real deal. At the age of 18 he jumped into the NHL and displayed a level of brilliance that lived up to the hype, averaging over a point-per-game with many of those points coming of the highlight-reel variety. Since being named captain in 2013, Benn has done nothing but dominate for the Dallas Stars. His rare combination of size and scoring ability makes him almost impossible to stop. In the past three seasons, Benn has averaged over a point-per-game and was awarded the Art Ross Trophy in 2014-15 for being the league’s top scorer. The 2nd overall pick in the 2013 entry draft has lived up to the hype of being the highest drafted Finnish-born forward of all-time. Already an undisputed first-line center, Barkov played a huge role in helping the Florida Panthers clinch the Atlantic Division this year with 59 points in 66 games. Measuring up at 6’6 and 230 lbs, Victor Hedman is a hard player to miss. With outstanding skating ability and shutdown skills, the big Swede has been a rock for the Tampa Bay Lightning over the past six seasons and in that time has become of the league’s top defenseman. The San Jose Sharks captain may be the most unsung superstar in the NHL today. The Wisconsin native plays a well-rounded game but is best known for finishing in the clutch, in the past 3 seasons only Alexander Ovechkin has scored more than Pavelski’s 116 goals. He may be known as Little Joe in NHL circles, but when it matters the most, he always manages to get it done in a big way. The two-time Stanley Cup Champion may be the most complete player in the NHL today. Not only has Kopitar led the Los Angeles Kings in scoring for 8 straight years, but he has also been nominated for the Frank J. Selke Trophy as the league’s top defensive forward for two years in a row. And may be the favorite to take it home in 2016. Once the puck gets on his stick you better, pay attention because it’s time for the Tarasenkshow. With world-class speed, puck handling and shooting ability, Vladimir Tarasenko has quickly emerged as one of the most electrifying players in the NHL today and has drawn comparisons to fellow countryman and Russian legend Pavel Bure. Since arriving in Philadelphia, Jakub Voracek has developed into one of the best offensive playmakers in the NHL. Teamed up with former EA SPORTS NHL cover athlete Claude Giroux, the Flyers should have one of the best 1-2 punches in the Eastern Conference for years to come.